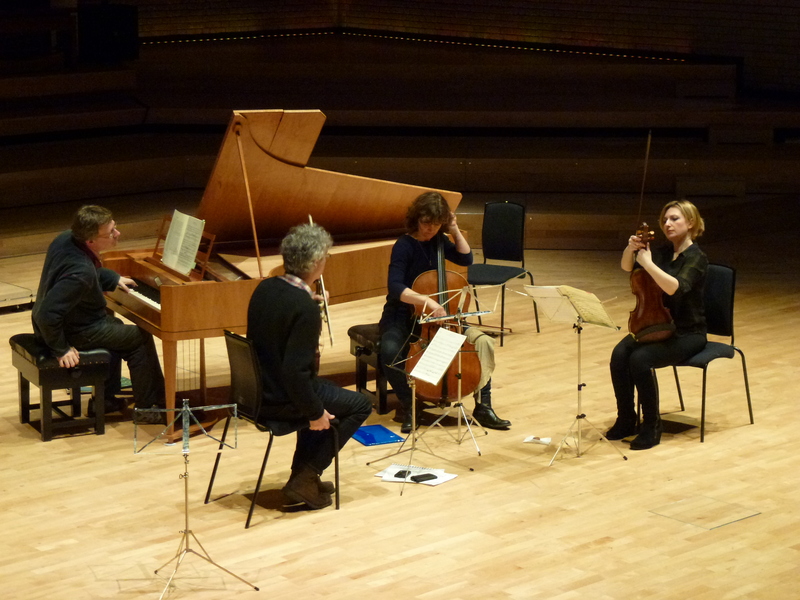 Ensemble DeNOTE’s recent concert of Mozart, Beethoven and Hummel quartets in the fabulous newly renovated concert hall at the RNCM went down a storm and was hugely enjoyable. We’re already thinking about the next visit, when we hope to include some side-by-side string coaching for students as part of our education work. The next day I stayed on to do a lecture recital on Texts and Improvisation in Mozart’s Sonatas, using the RNCM’s Derek Adlam Streicher 1814 copy (pictured in rehearsal with Peter Hanson, Rachel Roberts and Ruth Alford above). This event is an excellent strand of the RNCM’s outreach programming devised by Michelle Castelletti, the RNCM’s visionary Artistic Director, and has the very desirable effect of bringing members of the general public into the centre of the conservatoire’s mission (audience members from our concert the previous night got in for free!). In the presentation, I encouraged an approach to Mozart’s texts that retain a mindfulness of the gap between what is notated on the page, and the probably rather different performances that Mozart either gave himself, or expected of others. These certainly incorporated a significant degree of either pre-planned or spontaneous creative improvisation (or both), for instance, in repeat sections, of movements where Mozart simply indicated a ‘Da Capo’, rather than writing the music out all over again. I illustrated how – taking this approach to an extreme that I might not risk in an actual recital – you can turn a ternary form slow movement with ‘Da Capo’ towards something that functions more in the manner of a concerto first movement – raising associated tricky questions about the status of and boundaries between different genres that appear to be so fixed on paper. I also touched on the sense in which the instrument teaches you how to respond to such expectations on different occasions and in different spaces. Illustrations on this occasion included the sonatas K.330 and K.570, along with the D Minor Fantasia, K.397, which Mozart left incomplete (and published as such in 1804, though in 1806 a completed version by August Eberhard Müller appeared, featuring a tiny 8-bar D major coda that many of us will have learnt in our piano lessons – but which I never play, instead improvising a rather lengthier conclusion out of the musical materials from the main body of the piece). It’s always a pleasure to try to communicate to non-specialist audiences what has sometimes taken an entire book to describe (in my case, Understanding Mozart’s Piano Sonatas: Ashgate, 2010), especially when aided by a lovely instrument such as Derek Adlam’s Streicher 1989 copy with its silvery treble tones and attractive moderator pedal, and the fine acoustics of the Carol Nash Recital Hall.